1.2 What is oily fish? 1.3 Why is oily fish good? 1.7 All oily fish is good? 1.10 How much oily fish should we eat? 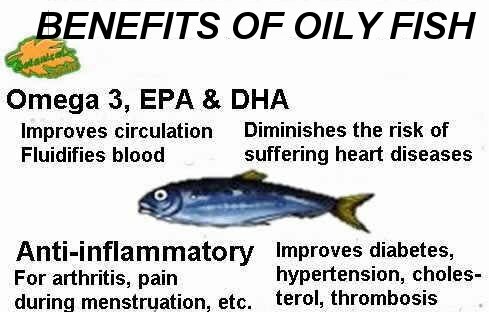 1.12 Do you need to eat oily fish to have EPA and DHA? The term oily fish or blue fish can be applied to edible marine or freshwater fish with a higher fat percentage of 2.5%. – Semi-fatty fish (2.5 to 6% fat): tuna, albacore, anchovies, river trout, mullet, etc. 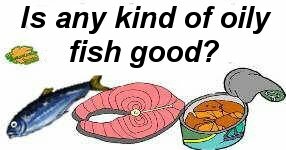 – Fatty fish (6% fat or more): salmon, trout, mackerel, sardines, herring, halibut, mackerel, carp, swordfish, salpa, etc. – White or lean fish: It contains less than 2.5% fat, and within this group fish such as sea bass, monkfish, hake, cod, grouper, sea bream, perch, sole, etc. Why is oily fish good? Oily fish (fatty and semi-fatty fish included) is one of the richest food in omega 3 fatty acids, which has benefits to increase good cholesterol, protect against arteriosclerosis or poor circulation, and reduce the risk of heart disease. In addition to omega-3 fats, oily fish also contains EPA and DHA, another type of fats (called “eicosanoids”), which are derived from omega 3 and have potent anti-inflammatory, vasodilator, to thin blood and improve circulation. EPA and DHA fats are essential for heart health, because they improve endothelial function (tissue that forms blood vessels) and protect against the formation of cholesterol plaques in the arteries. Omega 3 is a natural anticoagulant, improve circulation, control blood pressure and insulin resistance. These fats can also have positive effects on mild depression and increase antioxidant enzymes in the body. Omega 3 are placed on the walls of the cells, give them stability and improve functioning. DHA is found in large amounts in neurons and nerve connections and is very important for brain function. EPA acts more at the level of cardiovascular health, but the body can transform EPA into DHA and vice versa. Oily fish is also one of the richest food in vitamin D, whose deficit has been associated with increased incidence of cardiovascular diseases, intestinal diseases, and helps prevent osteoporosis. Curiously, eating small fish with bones, provides a very high amount of iron and calcium. It has been shown that EPA and DHA components have beneficial effects in many diseases. EPA acts more on circulatory diseases such as diabetes, hypertension, thrombosis, high cholesterol, heart failure (heart disease). Fish from very cold water are very rich in EPA, a powerful blood fluidizer that, in these fish, acts as an antifreeze. DHA fats in effect focuses more on the brain to improve memory and concentration. These fats can have benefits on hyperactivity, mild depression, schizophrenia, multiple sclerosis, and other diseases of the nervous system. Omega 3 is also anti-inflammatory and helps reduce inflammatory symptoms of arthritis, premenstrual syndrome, Crohn’s disease and ulcerative colitis. In studies it has been proved how fish oil supplements have achieved in some cases to reduce the amount of anti-inflammatory drugs. All oily fish is good? 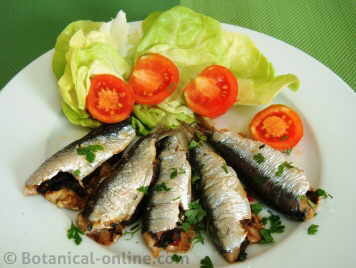 Fresh small oily fish is the most recommended one because it contains less mercury and heavy metals. The most contaminated fish are salmon and tuna. Moreover, canned fish (preserved in oil or not) or salted fish contains a lot of salt, so it should also consumed much less frequently. Fried fish has the disadvantage that the frying temperature deteriorates omega 3. In addition, if it has been fried badly (oil smoking), it may contain hydrogenated fat. Oily fish should be cooked properly, That is to say, at low temperature: papillote, steamed, baked (low temperature) or grilled at low temperature, and better covered, so they do not burn. They can also be eaten without cooking, using macerated in lemon juice and herbs (or freezing 48 hours to prevent anisakis), for example anchovies in vinegar or sushi. Broiling or burning fish deteriorates fats and nutrients (omega 3 fats, glutamine, vitamins, etc.) and lose much of their profits. It is not recommended: fish barbecuing, fried fish or plates too burned. Rounding out the properties of omega 3, it is highly recommended to accompany fish with foods rich in antioxidants. For this purpose simply add a squeezed lemon, raw garlic, fresh coriander, or fresh parsley above the dishes. Vitamin C that provide these foods increases the lifetime of omega 3 fatty acids to protect against oxidation, extending its benefits in the body. It is recommended to take omega-3 rich foods daily, such as nuts or seeds (ground chia, ground sesame, walnuts, etc.). 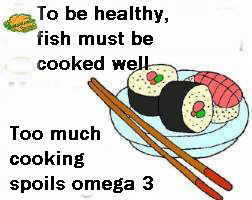 You can eat oily fish 3 to 4 times a week. Adequate ration is about 150 grams. People with high uric acid levels should consume less oily fish because it is very rich in purines, and remove red meat. In these cases, it is recommended to combine it with foods with few purines. For example, if you have eaten sardines at lunch, combined with lots of vegetables, and take eggs for dinner (eggs do not contain purines). 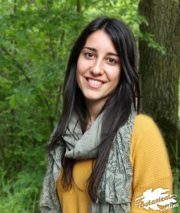 Oils, nuts and seeds are rich in omega-3 fats of plant origin, that our body must convert in the liver into EPA and DHA. With omega 3 oily fish this metabolic process should not be performed because these fats are already naturally present in the food. But some factors can block the transformation of omega-3 into EPA and DHA in the liver, these are: alcohol, snuff, trans fats, excess of saturated fat, and some medications (anti-inflammatories, birth control pills, etc.). Do you need to eat oily fish to have EPA and DHA? Oily fish is not essential in the diet. 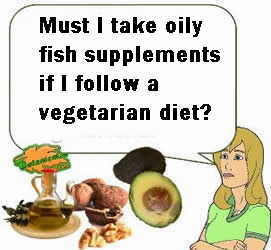 It is possible to take a complete diet without eating fish or having to use fish oil supplements. As mentioned above, the body can make EPA and DHA from omega 3 which plant foods provide. In a vegetarian diet to ensure the contribution of omega 3 diet is recommended to consume any of these foods daily: ground flax seeds, ground chia and walnuts. It is also recommended to avoid the factors preventing the transformation of omega-3 EPA and DHA, which are those already mentioned above: Tobacco, alcohol and foods with trans fats. In case of heart disease, hypertension or certain health ailments, other supplements are recommended. More information on Omega 3 and other essential acids.